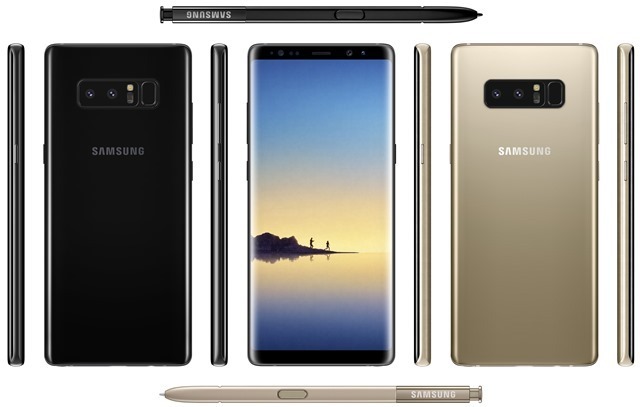 The official technical specifications of the Samsung Galaxy Note8, has been leaked, a day after the press render images of the Phones were outed. And per usual, this new leak also comes from evleaks. The Note8 features a 6.3-inch SuperAMOLED display, with a resolution of 1440 x 2960 pixels, and has an 18.5:9 aspect ratio. The device will be powered by Qualcomm'’s Snapdragon 835 in the U.S, while the rest of the world will have a variant with the Exynos 8895 chip, manufactured by Samsung. The Note8 will come with 6GB of RAM and 64GB of internal storage, with a microSD card slot for expandable memory. In the camera department, the Note8 sports dual rear cameras, with 12 megapixels sensors and Optical Image Stabilization in both lenses. The main camera is a wide-angle lens with dual-pixel autofocus and an f/1.7 aperture, while the telephoto lens offers 2x optical zoom and has an f/2.4 aperture. The front camera is an 8 megapixel selfie lens which has autofocus support, and an f/1.7 aperture. The Galaxy Note8 is packed with a 3,300 mAh battery which supports fast charging over USB Type-C or wirelessly. Size wise, these are the dimensions of the Note8: 162.5mm x 74.6mm, with the device’s thickest point measuring at 8.5mm thickness. The Note8 will be available in 2 colours initially: Midnight Black and Maple Gold, and will come in two more colours later: Orchid Grey and Deep Sea Blue. As a reminder, the Note8 will be launched on August 23rd, and will retail from September for about €1,000 which is equal to about Rs. 75,000 or $1180. Samsung Galaxy Note 8 technical specifications price leaked ahead of official launch.